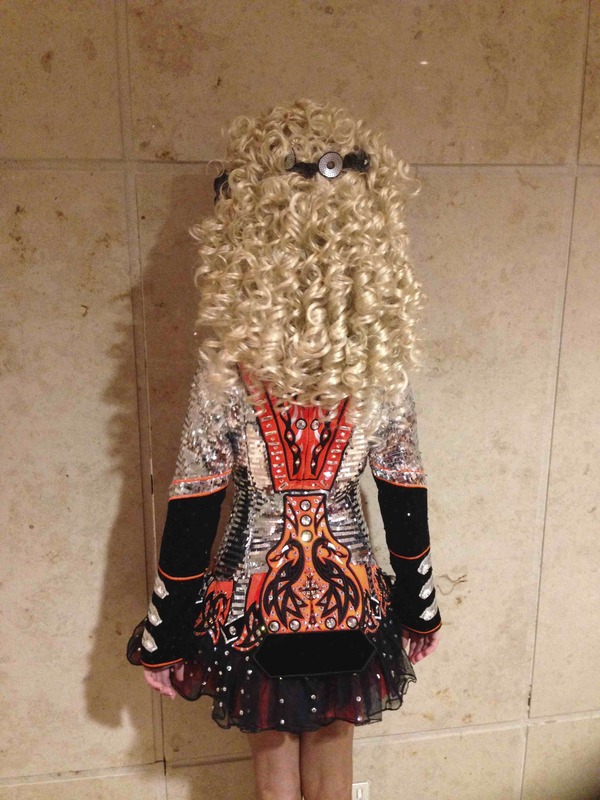 This eye-catching Avoca Celtic Designs’ dress was designed by Aisling Toal-Casey of Colorado-based Celtic Steps for the 2014 World Championships and has been worn for eight months. It is kept in a smoke free home and is in perfect condition. The majority of the dress is made of a high-quality black velvet and very durable and unique silver, rectangular shaped sequin. The one-of-a-kind, dramatic bodice (front and back), cape and skirt, have been “blinged” with more then $500 in Swaroski crystals. The black tulle skirt is lined with an orange silky fabric underneath that flutters beautifully with leaps and kicks. It is a wonderful, high-quality (sturdy) dress that dances beautifully, has been greatly admired at domestic and international competitions and has definitely provided great confidence in it’s current owner. Asking Price: $US999. Shipping costs are included for my own country, overseas shipping is extra. Will accept returns and refund the cost of the dress, buyer to pay all shipping costs.